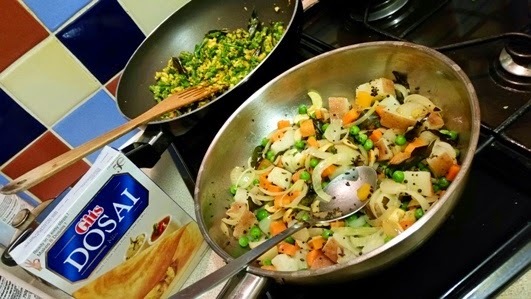 Continuing the theme of accidentally vegan food, here are some other Indian dishes that I cooked during my vegan month. As I utilised a range of ready-made elements these were actually speedy enough to prepare quickly after work too. Firstly from the south of India, the classic masala dosa, and also the classic Gits dosa mix. It's going to be very hard to replicate a proper paper thin dosa at home, but actually the Git's mixes work pretty well even if my dosas were a little on the thick side. I cooked quick potato filling to go in them, as well as a green beans thoran. I basically used this recipe for the beans, which proved to be excellent; fresh and crunchy, beans and coconut are an excellent combination. The potato masala was a simple mix of a medium potato, carrot, onions and peas with some added flavourings. Firstly fry a couple of teaspoons of mustard seeds in some hot oil until they start popping, and then fling in a small handful of curry leaves, around a tablespoon of ginger paste, a medium chopped potato, a small chopped onion, and a generous sprinkling of salt. Turn the heat down, put a lid on and leave until the potato is virtually cooked through. You can also add a little water if things are starting to stick. Then put a couple of handfuls of frozen peas in, and put the lid back on. Once the peas and potato are fully cooked, add a small handful of roasted cashew nuts, and give everything a good mix. 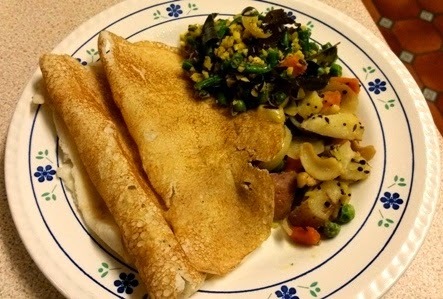 Once the vegetables are done, I made up the dosa mix and cooked these in a non-stick pan. You'll definitely need to work quickly to spread the mix to get it as thin as possible, but even if they are bit on the thick side, they are still very tasty. 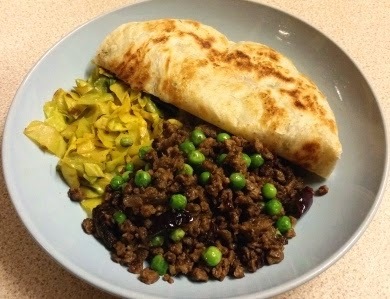 Moving further north, I utilised some ready-made Shana parathas to go with my soya mince keema. I always tend to have a packet of these in the freezer as they are very handy for emergency dinners, and on further investigation I also discovered that they are vegan (huzzah). Soy mince, like Quorn, is pretty flavourless so you need to be very generous with your other flavours. For this keema I fried two red, sliced onions in a couple of tablespoons of plain oil, with a couple of bay leaves, a stick of cinnamon, and two cardamom pods. Once the onion was softened and slightly browned, I added 2 tablespoons of garlic/ginger paste, a heaped teaspoon of chilli flakes, and good sprinkling of salt. This was all cooked over a medium heat, until the onions were nicely browned. At this point I added 3 teaspoons of garam masala, and 1 teaspoon each of ground coriander and ground cumin. After allowing the spices to fry for a bit, I tipped in around 300g of vegan soy mince. Once everything was well mixed and heated through (around 10 minutes), a couple of handfuls of frozen peas went in, and I left everything to simmer gently until they were cooked through. You should end up with a dry and spicy keema, which can be neatly scooped up by some hot off the pan parathas. So there you have it, two pretty speedy dinners, which are full of flavour and spice and just happen to be vegan. As I mentioned before, Indian food is probably the easiest vegan food to prepare. Lots of it is accidentally vegan, and it's damn tasty. This is part recipe, part assembly job for a snack that can be easily expanded into a full-on meal. Chaat is the Hindi name for the Indian snack foods that are frequently available when you're out and about in any major town. They usually have a fried, crispy element, partnered with something sharp and tangy, and so of course are delicious. 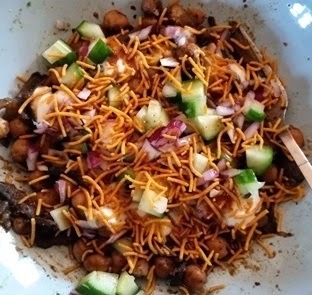 Here's my version of a cheat's chickpea (channa) chaat (I win at alliteration). You could definitely make your own tamarind chutney and channa masala spice mix, but I don't know anyone who makes their own chaat masala, so think I've still a good level of authenticity! This version is vegan, but you could add a bit of yogurt on top too, especially if you make your chickpeas uber-spicy. Or indeed use a non-dairy, plain yogurt and still keep it vegan. 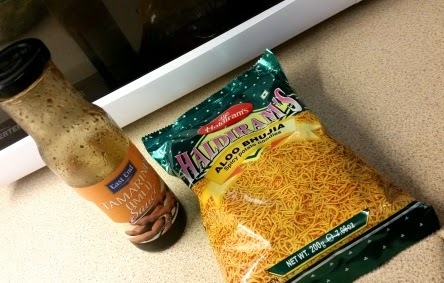 I purchased the above from my local Indian supermarket, but the chutney and bhujia below were available from Tesco. To make the channa masala heat a tablespoon or so of a plain oil in a pan, and when hot (but not smoking) tip in the onions and bay leaf. Stir and leave the onions to soften a bit. When they are lightly browned, add the ginger, garlic and chilli and cook for a few more minutes, before adding the spice mix. Give everything a good mix and leave to cook for a few more minutes until the spices lose their raw edge. Then add the tomato puree, and a little water to stop things sticking. Drain the cooked chickpeas and add to the pan, and simmer for 10-15 minutes (adding a little more water if needed, to make a thick 'gravy'). 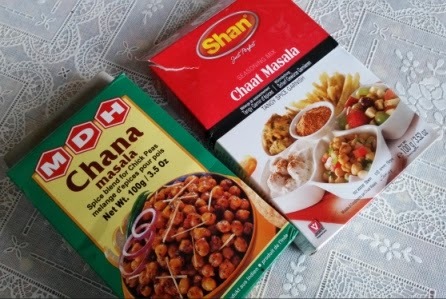 If you're using a ready made channa masala mix, it's unlikely you'll need any extra salt but do check. Chaat masala contains kala namak (black salt) which is quite sulphurous and can be an acquired taste, but somehow becomes quite addictive, quite quickly. This is an excellent accidentally vegan dish, which combines spice with fried, crunchy things- how could it not be delicious? So here's a recipe that falls into the accidental vegan category. Home made baked beans form an excellent brunch option, and are more satisfactory than just pouring some out of a tin (though the work of Mr Heinz has its place too). Making them means that you have the option of adjusting the levels of seasoning and adding some extra flavours and spices too. For this batch I added a little chilli, but soy sauce, thyme, and mustard have all made appearances previously (though probably not together). Using tinned cooked beans might not seem quite in the spirit of things, but it does make this a pretty excellent meal to make from stuff in the cupboard, and without the need for soaking things overnight. 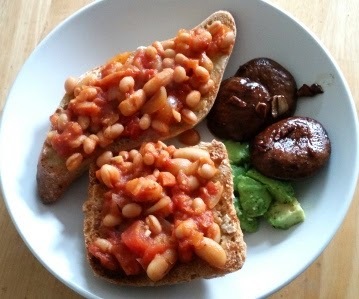 I think a key aspect of these beans is the chunky tomato sauce base, and with some garlic mushrooms, and sliced avocado, this made a really filling and tasty winter (vegan) brunch. Warm the oil in a medium saucepan and then put in the onion, carrot, celery, and bay leaves. Stir well and leave to cook over a medium/low heat until the vegetables are soft (probably around 15 minutes), then add the garlic, dried herbs and chilli flakes and cook for another 5 minutes or so. Add the fresh tomato if you're using any, and then the tinned toms and puree. Make sure everything is well mixed, stir in the sugar, salt and pepper, and pour in around half a tin can full of water. Leave the tomato sauce to simmer gently for around 30 minutes, adding a little more water if it ever looks super thick. Tip in the beans and simmer for another 5-10 minutes before checking the seasoning. Serve piping hot on some nice bread (I had some fancy sourdough and spelt and sunflower seed options), toasted and spread with something non-dairy (eg olive oil or a sunflower spread), and bask in the glow of being an accidental vegan. I randomly decided to do another vegan month for February. I quite enjoyed it last time round, and now feel I have a lot more confidence in cooking in a vegan stylee, and not just falling back on a default option of Linda McCartney sausages and vegetables. 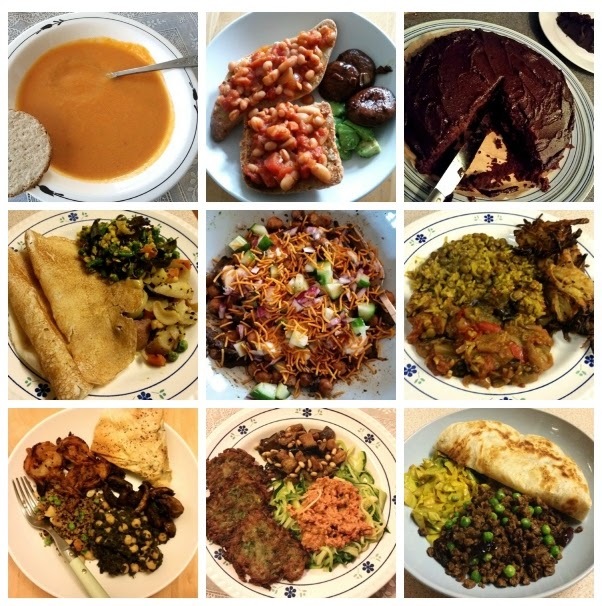 This time round, I expanded into exploring some more vegan baking, cooked a lot more Indian food, and other food that just happened not to have dairy as a key ingredient. And I have to say I really enjoyed it again. 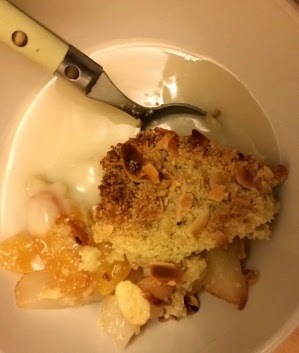 So here's my recipe for vegan apricot, pear and almond crumble with custard. In the depths of a gloomy February a hearty hot pudding was an essential, so I was delighted to discover that crumble and custard is very simple to veganise. These days I usually buy ready-made, fresh custard from the supermarket, but googling revealed that the instant custard powders I remember as a kid were accidentally vegan; consisting of just cornflour, vanilla flavour, and colouring to be mixed with sugar and milk (no eggs involved!). So on this principle, I warmed a pint of almond milk with around 2 tblsp of caster sugar, until it was fully dissolved. I then made a loose paste with around 1.5 tblsp of corn flour and a little more milk, and gradually mixed that into the hot milk. Once the custard had thickened, I added 1 tsp of vanilla extract. You can just adjust the amount of cornflour so your custard is as thick or thin as you prefer. I suspect using soy milk would have resulted in a less nutty taste, but this was still very nice. Alternatively, you could just use Bird's custard powder with your plant-based milk of choice, for a fully traditional yellow custard. The crumble was made with a fruit base of four sliced Rocha dessert pears, which did not require any advance cooking, and a tin of apricots halves (feel free to use fresh ones in the summer). The crumble topping consisted of 125g plain flour, 75g ground almonds, 75g sugar, 100g sunflower spread, and a handful of flaked almonds. Combine the flour, sugar, ground almonds and spread together and until they form loose crumbs and then stir in the other almonds. Scatter the topping on the fruit, and bake at gas mark five for around 25 minutes or until lightly browned on top, and serve with the hot custard. This should be enough for six people, or several helpings for two across a weekend. Cooking from Persiana and hello 2015! I had some vague plans of getting some blog posts out before Christmas, but obviously that didn't happen, so apologies small but select readership. However, to make up for it, here is a post on what has become one of my favourite cook books. 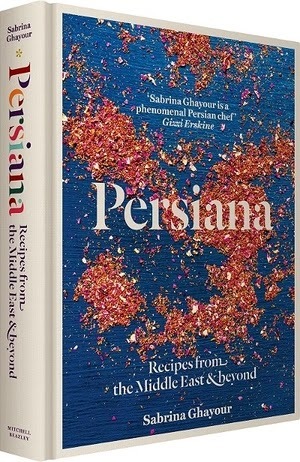 I am mildly embarrassed to admit that I think I got Persiana by Sabrina Ghayour for my birthday in the early summer, but didn't get round to cooking from it until last month. After this absurd delay, I thought I'd go for it and make our entire Christmas lunch with recipes from it. This would be the first time I cooked those recipes, but I laugh in the face of pressure (and had a back up plan of crisps and biscuits in place). So I am delighted to report that everything was flipping delicious (mega-apologies for the terrible picture but a lack of proper camera and the desire to eat, further diminished my limited photography skills). My menu was mainly vegetarian, with a bit of fish. 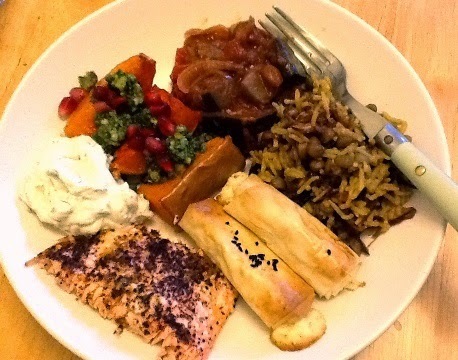 So from the top we have aubergine chermoula, mojardara (rice with lentils and crispy onions), borek (feta pastry cigars), citrus-spiced salmon with sumac, cacik (yoghurt with cucumber, garlic and dill), and butternut squash with pistachio pesto and pomegranate. Persiana contains recipes from the Middle East and Iran, some traditional and some with a modern take, and handily for me has loads of vegetarian-friendly snacks, sides, and main dishes, as well as a scattering of fish. It's introduced me to lots of new spice combinations that I would never have considered before, as well as new takes on some of my favourite ingredients such as squash and aubergines. Everything I cooked for the holidays was packed with flavour, fresh but still comforting on a winter's day, and also pretty straight-forward to put together. In fact I was so impressed by Xmas lunch, that I also made broad beans with garlic, dill and eggs (baghala ghatogh) and a pistachio and feta dip from Persiana for the new year (along with various other things). So a big thumbs up for Persiana. It's always good to find a chunky hardback that justifies its place on the bookshelf, and I have a feeling that I'll be cooking a lot more from it this year. I like to think that I'm on top of the latest food trends, even if I'm not that actually interested in many of them (donut burger anyone?). However Indian sweets cooked in a microwave, have somehow passed me by, despite being around for ages apparently. I first came across this method for making kalakand, an Indian milk-based sweet, on the rather excellent Bong Mom's Cookbook blog. I have to say that I was a little sceptical about the whole thing, but this was one of the simplest Indian sweets I have ever made. Admittedly, I am usually an Ambala girl rather than a stirring milk for ages person, but this is a recipe that came nowhere near testing my limited patience. 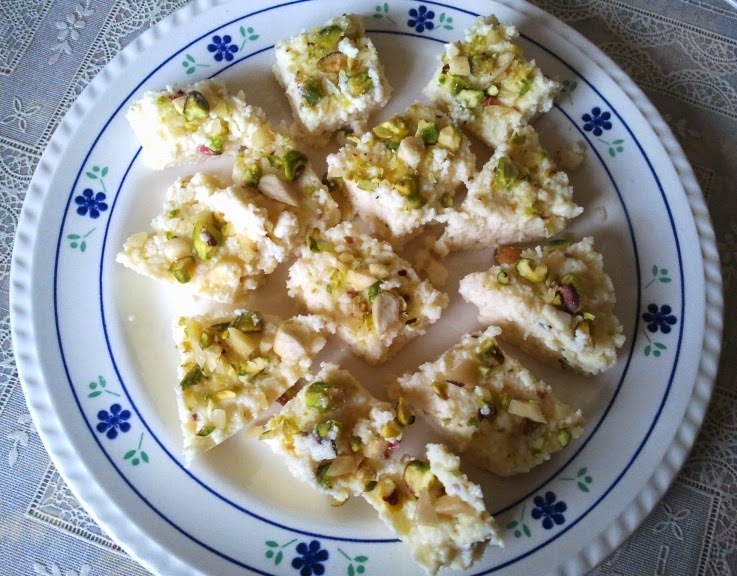 Kalakand are a little bit like burfi or Bengali sandesh, but with a softer texture and are more obviously milky; sort of like cottage cheese combined with fudge, though that makes them sound horrible (which they aren't). These kalakand were not too heavy or sweet, and were rich with cardamom. I followed the Bong Mom recipe pretty accurately, except that I didn't bother with the chocolate topping and just used chopped pistachios and almonds instead. I also added the crushed seeds from around 4 or 5 cardamom pods to the milk mix. Here are the ingredients with UK measurements. Firstly you'll need a suitable dish that can go in the microwave, and is relatively shallow, so your kalakand aren't too thick. I have a 1000 watt microwave, and after mixing all the ingredients except the nuts, I cooked the kalakand for five minutes at full power, followed by another five minutes, stirring well in between. If it looks like it's going to boil over at any point, stop microwaving and stir again. Then microwave in one minute bursts, until the mixture thickens, but is still a little moist on top. This is likely to take another five to seven minutes, so it will have been in the microwave for 15 to 17 minutes in total. This is obviously going to vary depending on the type of microwave you have. Once the kalakand is firm (but not totally dried out), sprinkle the nuts on top and press down slightly. Let the dish cool a bit and then chill in the fridge overnight. Take the kalakand out of the fridge 30 minutes before you want to eat them, so they come up to room temperature, slice into bite size pieces, transfer onto a jazzy serving dish, and tuck in. Ideal with a nice cup of tea.